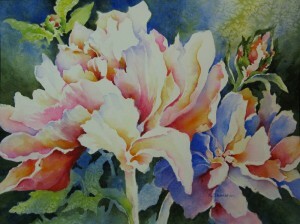 The UU Gallery will feature watercolor paintings by Karen Shanahan for the month of July. An opening reception is scheduled for Friday, July 5 from 4 – 6 pm. The public is invited. Karen Shanahan’s goal is to emphasize light in her watercolors. Light touches the simplest of objects, illuminating and turning them into magnificence. Karen has been painting seriously since 2003 when she took workshops at the Peninsula Art School. The style of painting in which she so successfully paints is often referred to as negative painting. Her mentor, Bridget Austin, is a nationally acclaimed artist and teacher of transparent watercolor. Karen has traveled to Bridget’s workshops both locally and in foreign settings. She mainly paints flowers and still life. Karen states, “painting into negative space is challenging and fascinating. The negative space is usually the area surrounding the positive objects to be painted. By concentrating on and painting that negative space I find the object(s) and make them suddenly appear! With a value sketch I have an idea of the composition and where I expect to be finding my objects. With subsequent washes and working from light to dark, I paint around the objects, finding details and letting the negative space tell some of the story. I paint some detail on these found objects bringing them to life as a subject”. The UU Gallery is open on Sunday from 11:00 am until 12:30 pm and on Monday, Wednesday and Friday afternoons from 1 – 3 pm.